Andres Sepulveda hacked and spied in elections in Colombia, Costa Rica, El Salvador, Guatemala, Honduras, Mexico, Nicaragua, Panama, and Venezuela. A highly sophisticated Colombian hacker rigged elections across Latin America in favor of right-wing candidates for almost eight years, pulling in hefty paychecks for highly-coveted dirty work in at least nine different countries’ elections, including for Mexican President Enrique Peña Nieto’s rise to power. A Bloomberg Business article published Thursday told his story for the first time, forcing the Mexican government to deny on Friday that Peña Nieto’s campaign spied on rivals. Andres Sepulveda, now in jail in Colombia, was in the business of the “whole dark side of politics that nobody knows exists but everyone can see,” he told Bloomberg Business. He started with small jobs in 2005, but quickly ramped up to helping presidential campaigns in Colombia, Costa Rica, El Salvador, Guatemala, Honduras, Mexico, Nicaragua, Panama, and Venezuela smear, hack, and spy on their left-wing rivals for a bill of at least US$12,000 per month, and often more. His first gig was for the re-election campaign of former right-wing Colombian President Alfaro Uribe in the lead-up to the 2006 election, which Uribe won. Sepulveda hacked a rival’s website and campaign database. 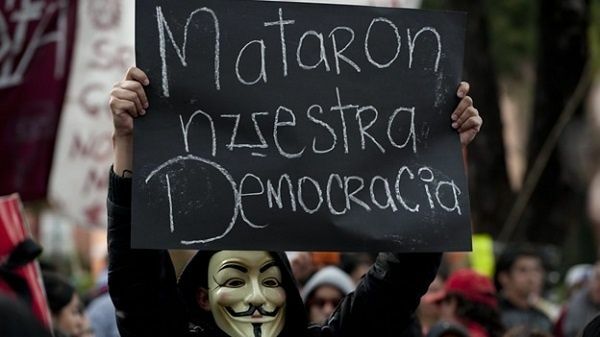 “They killed our democracy,” Mexico City, Aug. 31, 2012. But the jobs grew in budget and scope over the years. 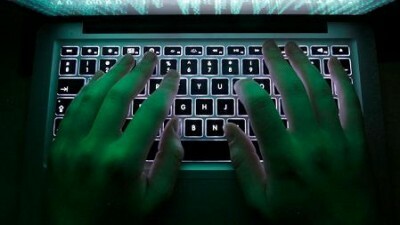 In the lead-up to Mexico’s 2012 presidential election, Sepulveda hacked, spied, and manipulated social media for President Enrique Peña Nieto’s campaign with a US$600,000 budget as the PRI aimed to regain power after losing it in 2000 for the first time in over 70 years. Peña Nieto, who was shown ahead in the polls early in the campaign, won the election amid widespread allegations of electoral fraud. His main rival, Andres Manuel Lopez Obrador, then of the PRD, demanded a full vote recount. Sepulveda also had a role in the 2009 campaign of Honduras’ right-wing post-coup National Party President Porfirio Lobo, and spearheaded malicious campaigns against Nicaragua’s socialist President Daniel Ortega in 2011 and Venezuela’s former President Hugo Chavez in 2012. All the while, Sepulveda told Bloomberg Business that he was working for Miami-based political consultant Juan Jose Rendon, who former Salvadoran leftist President Carlos Mauricio Funes accused in 2014 of running dirty campaigns across the region. Rendon denied to Bloomberg Business of having collaborated with Sepulveda on illegal jobs. Sepulveda is now serving 10 years behind bars for various crimes including espionage and conspiracy to commit crime linked to hacking during Colombia’s 2014 election. He told his story to Bloomberg Business in hopes of getting a lighter sentence by showing he’s owned up his dark past.